This week, Caitie McCoy, IISG environmental social scientist, visited the University of Illinois at Champaign-Urbana to talk with students about careers in the field of human dimensions of natural resources. 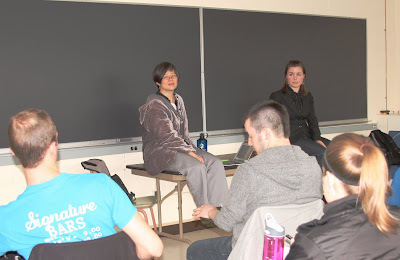 Caitie’s first session took place in Ming Kuo’s Social Science Research Methods in Natural Resources class. Later she took part in another discussion with graduate and undergraduate students, some who joined by webinar. Caitie talked about her background experience and training in human dimensions as well as her current position with IISG. She provided practical advice on the process of applying to graduate schools and how and where to search for jobs in this field. In the photo above, Dr. Kuo and Caitie, left to right, listen to a student’s question.